"It’s too complete a story to go backward. Yes, forwards is the only way to go. Looking back is such a waste isn’t it? It’s what’s going to be that we should be bothered with. Not all that was. I mean, the past is the past. History. Learn from it and move on." A couple of months ago I had the pleasure of spending the evening in Ian McKellen's pub in Limehouse, London. Whilst the man himself was not in residence my attention was drawn to a familiar looking staff behind the bar. The excitement that rose inside me as I realised that this was the very staff wielded by Gandalf in the Lord of The Rings films confirmed on me the status of geek and huge fan, I am not alone in this and there are great number of people who attend cosplaying events dressed as their favourite characters. Now, of course, there is nothing new about this level of obsession ,or dedication as I like to label it, and shows or films throughout time have attracted huge fan following. The feeling of belonging to a movement and sharing a strong commonality has a big draw and at many points in my life has given me renewed purpose. Waiting For Gandalf touches on the themes of committed fandom but also explores some of the reasons as to why fans are so drawn into the fictional realms created. Kevin is a Ringer, a dedicated fan of Lord of the Rings, and it is his story that is grippingly shared with audiences within the play. As he waits in a queue outside a local bookstore for the arrival of Ian McKellen he shares his fervour about finally getting to meet his idol. For Kevin, Gandalf represents all that is good and pure and it is his powerful and steadying hand that guides Frodo on his quest. So, by extension and by totally immersing himself in the films, Kevin can also benefit from the sage and wizardly advice offered to the Fellowship of the Ring. 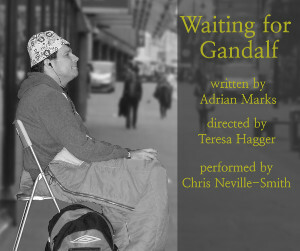 Chris Neville- Smith is entirely convincing in his portrayal of a fan that is risking his very health by camping outside a bookstore and brings to vivid reality a fan that has more than a casual affection to Gandalf. The play is part monologue and part interaction with the audience which effectively draws you into Kevin's world. At times, during the performance, this is so effective that the audience actually become part of the queue waiting in line. Audience participation and involvement very much seems to be a common strand with Sweet Venues offering this year and never has it been so poignant as Kevin rushes past audience members as soon as they enter the room. His desire to be first in line a promise he made himself, although he does apologise profusely for this! For Kevin common courtesy and respect matter and most of his ire is directed at those who do not share this. There are sometimes reasons why people become obsessed with a film or television show and often this is to hide a deep and wrenching pain or emptiness. Somehow life has become unbearable for Kevin and as his disassociation with both family and life in all its blandness increases so does his connection to Lord of the Rings. Neville-Smith's portrayal of Kevin as a deeply caring and emotional man with a darker and abusive secret is something that the audiences are slowly exposed to. The final scenes dealing with elusive closure and loss are heart wrenchingly sad and so wonderfully delivered that I wanted to leave my seat and hug him. There are very striking reasons as to why Kevin relates to the characters within Lord of the Rings and this is not uncommon. Those that are not as committed in their appreciation of a particular film can often be very derisive of individuals that are. I have often been made to feel as if there is something wrong with me for being such a dedicated Doctor Who fan. Waiting For Gandalf touches, powerfully, on areas of abuse, loss and family break up but also the message of caring and acceptance with all in our society is one that could not be more timely. In a society that is too quick to judge what is seen at face value, Waiting For Gandalf challenges us to look a little closer.